Stopping in the sleepy village of Black Creek for a night’s rest, you and your fellow travellers find yourselves trapped as strange cultists work to awaken an ancient evil force. Now it’s up to you to stop the cultists’ curse. You must save the remaining villagers and discover the great incantation to stop the evil from rising and escape the village before the final bell tolls. 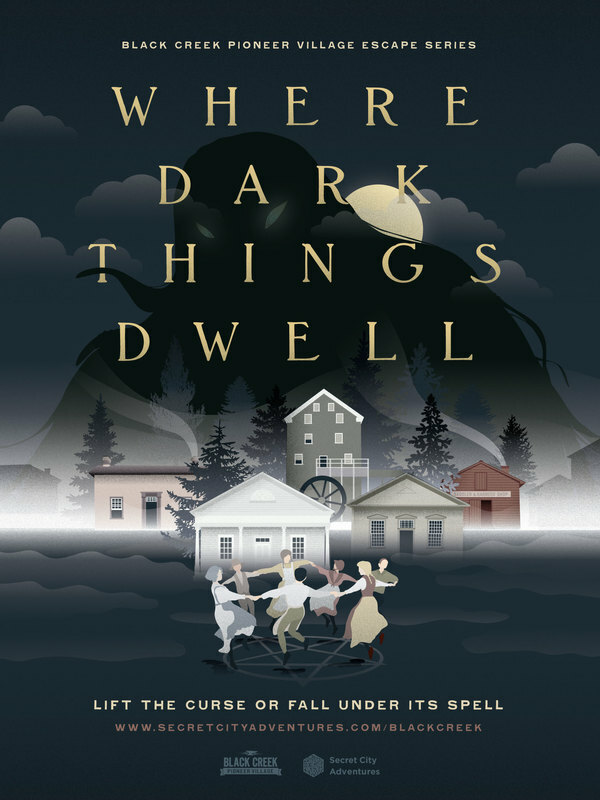 Where Dark Things Dwell is an escape-style game taking place throughout Black Creek Pioneer Village, playable by up to 60 people at once. With multiple buildings and outdoor areas to explore, each team must work together to uncover the dark secrets of the village and break the curse! When your adventure is finished, come back again and experience the other puzzles.